Later this month I'll cover how to make graphical titles for your slideshows, but first I want to acknowledge the obvious -- taking pictures of signs and using those images to help you tell the story. 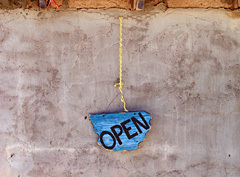 For example, the "open sign" I've shown here is both artistic and can be informative in a slideshow. And you don't have to present it just a static image. You can pan it through the frame, or you use it as a transition to activity inside. The real trick is to remember to take these shots while you're gathering source material for your project. Even if you don't use them as originally conceived, they become part of your stock image collection for future projects. Also keep an eye out for informative placards. Often they contain a wealth of informative that can really spruce up your show. 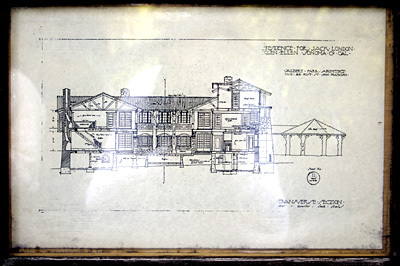 For example, this drawing was displayed at the ruins of "Wolf House" that Jack London was building for his retirement. If you captured a high resolution shot of this drawing, you could then zoom in on it during your slideshow as you described that part of the house. Ken Burns would be proud of you.